The Jeff and Deb Hansen Center was abuzz or abark last Friday as the Cyclone Country Kennel Club held the Cyclone Agility Trial. 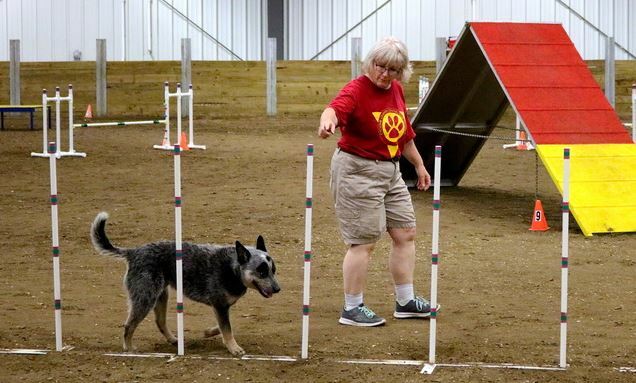 Mary Healey, Program Assistant II for ISU Animal Science also serves as the Agility Trial Chair for the event and said, "This event brings awareness of the trials to the Ames area and we had a great turnout. There were 200 runs on Friday, 300 runs on Saturday and 300 on Sunday. Despite the heat, the dogs ran great." The Cyclone Country Kennel Club was originated to provide classes and services with the quality and standards maintained by the American Kennel Club and its licensed or member clubs throughout the United States. Pictured below is Mary Healey with dog, Caris. Caris performed in the Jumpers with Weaves and Standard classes.